For me, when it comes to bases, I have never ventured out into the high end area, because there are so many gems hidden in the high street/drugstore. I've put my 5 current bases into categories so hopefully you can find a foundation that is the best for you. The Natural Base: In this category, I have 3 foundations which slot in. First up, probably one of my favourite foundations ever, which is Revlon Nearly Naked, which has a light-medium somewhat buildable coverage, that looks like skin, and is slightly dewy. I only have about 1-2 uses left out of this bottle so I'm holding onto it. Then, we have Rimmel Match Perfection, which literally makes your skin look like silk. It is yet again a light coverage but can be built up to something a little heavier if you wish. The colour is a little dark, but because it is so natural looking, once blended down the neck it looks seamless. The Bourjois Healthy Mix Serum is one that got everyone a little bit excited when people started to rave about it. This is another light-medium coverage but I find it easy to build this one if I need a touch more coverage. I'll briefly touch on the scent - its gorgeous. Fruity goodness which makes you want to smother it all over your face. The Glow-Getter: It's safe to say that most of you will have known which bottle was going to be slotting into this category. If you guessed the orange-lidded, shimmery stuff which goes by the name of Rimmel Wake Me Up, you get a round of applause. This has mixed reviews, and I am sitting on the fence. It is shimmery, but I have yet to experience the Edward Cullen look. The colour is what puts me off, this is about 2 shades too dark for me, and being the lightest shade in the range - it's slightly disappointing. The One for Coverage: Revlon Colorstay. This is my third bottle of the stuff, and being someone with bad skin I like this a lot. But, nowadays in some areas (I had a crazy 'dry skin everywhere' week recently), it looks a little too heavy, but maybe I'm just not blending it enough. But with an hours wear or so, I think it fades evenly and looks a much more natural, but maintains the coverage. really want to try that one from bourjois! i find match perfection can look a little streaky.. 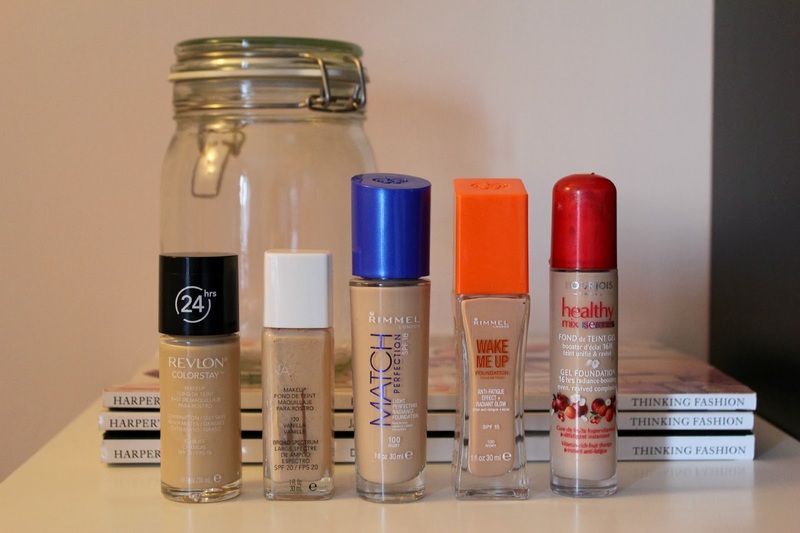 I love Rimmel Match Perfection, it's my favourite foundation at the moment. I do agree with you though, I've got dry skin and there are often times I can't wear Revlon Colorstay as it's so heavy. I used to wear the Revlon colourstay all the time and loved it! Unfortunately my skin changed and it doesn't suit me anymore but I actually miss it! I feel the same way about colorstay. it is bit too heavy, and I finished a bottle myself just now, and currently researching for my next drugstore foundation. Nearly naked sounds promising, but I hate that it does not have a pump. Bourjois is not available in the states, so not an option. I heard a few things about rimmel match perfection, and thinking about it. I think the rimmel wake me up is not available in the states, at least around where I live. A great round up! I've tried 3 of these foundations and have similar views. I love the Match Perfection, despite it clingy to my dry patches. I really dislike the Wake Me Up for the same reason as you, the colours available are awful, I bought what I thought was a good match and it's so pink I look like a lobster, definitely going into a blog sale post.. I bought Nearly Naked in totally the wrong shade, but base wise it's great. I love(d) Revlon Colorstay Foundation! But I found out that they changed their formula a while ago. The consistency is much thicker than the more liquid-y version I was used to. I am already looking to switch to a new foundation since it's so difficult finding the bottles with the older formula. Original formula listed water as the first ingredient, I think. Maybe the new formula is the reason you are having some issues with that foundation? It may be affecting your skin differently. Hope this helps.